Edit a repository credential to update repository access. Repositories allow automatically downloading packages from a repository without repeatedly entering your credentials during a DataStax Enterprise install job. Add a repository to use for automatically downloading Debian or RPM packages within the DataStax Enterprise repository. In addition to providing repo credentials, you can define custom URLs that point to your own mirror of the DataStax Repository. Delete a repository. There must be at least one repository defined for Lifecycle Manager to access DataStax Enterprise install packages. Edit a repository credential to update repository access. 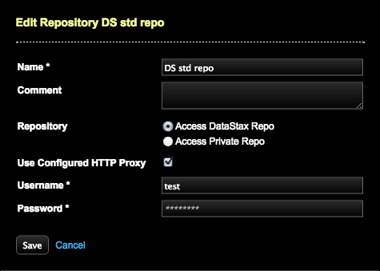 Make any changes to the DataStax Repo, private repo URLs, proxy usage, or credentials. Click the edit icon for the repository you want to edit. The Edit Repository dialog appears.